This is a ‘toe-in-the-water’ blog. By that I mean that it makes no claim to be a definitive study of British camouflage colours of World War II, merely a distillation of my current knowledge of camouflage colours as far as they relate to buildings. It is largely based on a combination of documentary research and paint analysis of buildings on a) the site of a wartime bomber station and b) a coastal command centre. The main concern was for the appearance of buildings as seen from the air. The Royal Air Force was not camouflage conscious until the expansion years of 1935-39. In 1935 the Air Ministry Director of Works emphasized to the Air Staff the absence of any policy for concealment and camouflage of RAF establishments at home. Progress was slow, and it was not until 1940 that all three branches of the services had formed camouflage branches. 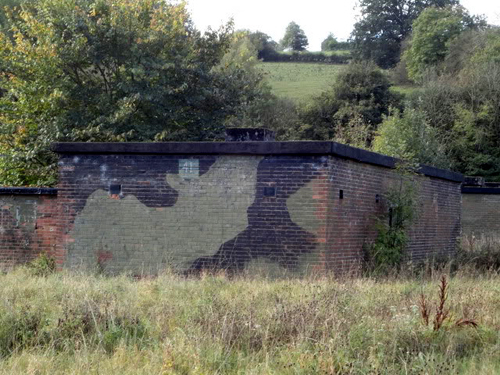 A General Camouflage Policy was developed in 1938, the aim being to treat, in a practical and economical manner, the distinctive features of an RAF station: buildings, landing grounds, boundaries etc. – so that an enemy pilot would be deceived or confused. It was assumed that the main purpose of airfield camouflage would be achieved if recognition of a target could be delayed, so preventing an attack, or at least causing it to be inaccurate. This General Camouflage Policy remained in force until it was discontinued in 1944. There were two main objectives: firstly, to break up the regularity and conspicuousness of the buildings; and secondly, to break up the airfield into a pattern more closely resembling the surrounding countryside. This was attempted by painting irregular, differently coloured, patches on the roofs, and surrounding ground. Paint was the object of intensive trials and research, and in 1939 the Paint Research Station at Teddington (now the Paint Research Association published a paper on camouflage paints. a) Bituminous Emulsions. These were intended for application to surfaces such as tarmac, felted roofs etc. Black bitumen emulsion paint was used for “hedge” painting and was most effective. b) Silicate Paints. These were used on cement and concrete surfaces. c) Oil-Bound Water Paints (Distempers). These were used on buildings and roofs, and withstood weathering but not mechanical wear and tear. This list was further refined and more information on these finishes is given below. The requirement of large quantities of earth-coloured pigments and the knowledge that supplies from overseas might be interrupted led to a study of natural sources around the country. This culminated in the publication of Wartime Pamphlet No 21 by the Geological Survey of Great Britain in January 1942 – Ochres, Umbers and Other Natural Earth Pigments of England and Wales. Dusting powders, consisting usually of chalk or gypsum, pigment and adhesive finely ground together were intended for simulation of field patterns on airfields. On the outbreak of war, camouflage schemes were put into operation as planned. Contracts were let for the supply and application of materials. Firms were allotted one or more Works area each and work in accordance with standard requirements was ordered direct by the superintending engineer who was responsible for the effective camouflage of his station. With the introduction of hard runways, experiments were carried out at Stradishall and Gosport to reduce the “shine” of concrete. At the former station paved areas were treated with fine pre-coloured slag chippings, and at Gosport with coarse pre-coloured stone chippings. Both these specifications being based, incidentally, on non-shine hard tennis court practice. By the spring of 1940, it was decided to use the “Stradishall” system of texturing runways and paved areas. All Commands agreed to this policy except Fighter Command who were unable to accept the abrasive nature of a “chipped” surface owing to excessive tyre wear. The “Hullavington” specification was adopted for fighter stations, and all fighter runways and hard-standings were coated with what became known as “pervious asphalt”. This was successful, if rather expensive. Further experiments were made with surfacing materials, and sawdust, tan bark, and granulated rubber were some of a number of materials that were tried. Eventually, wood chips that had been passed through a hammer mill were found to produce a long-lasting product that had very nearly the same optical properties as grass. This became the standard texture treatment for runways until the discontinuance of camouflage in 1944. In the spring of 1943 it was decided that the standard of camouflage could be relaxed in certain parts of the country, which was then divided, for camouflage purposes, into three Priority Regions. In No 1 Priority Region, which comprised roughly the South and East Coast of England up to the Humber for a depth of 70 miles, camouflage was continued to the original standard. In No 2 Priority Region, comprising an area 30 mile East Coast Belt from the Humber to the North of Scotland, camouflage was restricted to night deception only. In the remainder of the country – No 3 Priority Region – the new requirements implied the virtual abandonment of camouflage in approximately 20 per cent of the total number of stations in the country. At the same time as this partial relaxation of camouflage, schemes and specifications were overhauled so that as much of the camouflage work as possible could be incorporated as a normal building or constructional item during initial construction or maintenance. Further relaxations in policy followed in 1944. 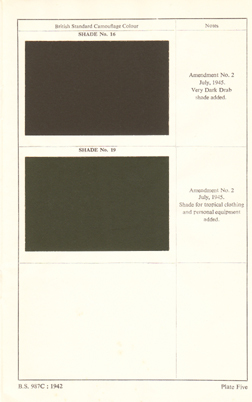 In April, only darkening down of buildings was permitted in Priority 1 and Priority 2 areas, either when newly constructed or when they became conspicuous due to deterioration of old camouflage. In August, camouflage was practically discontinued with the proviso that preservative painting would continue to be in dark tones or colours. c) Colours Used on Public Service Vehicles. 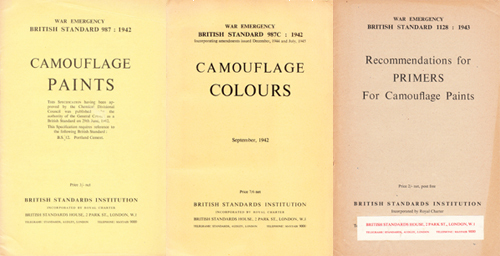 A further British Standard paint range appeared in 1942 illustrating a small number of colours for camouflage purposes – this was BS987C: 1942 Camouflage Colours. This range was further amended in 1944. So at least two years after the first camouflage paints were being manufactured, a British Standard was brought out in order to aid the supply and specification of such paints. A couple of amendments were issued leading to additions and deletions, not all relevant to buildings. From 1944 SCC15 (Olive Drab) took over from SCC2 (brown). It was meant to be similar to US Army Olive Drab No 9 and was adopted with Lend-Lease and the painting of vehicles in mind. Another colour – SCC 19 – was the colour for tropical clothing and personal equipment. 1 The surfaces must be satisfactorily prepared prior to the application of camouflage paint. One or, if necessary two coats of primer consisting of dark coloured red lead or white lead/red lead mixture may be required for protective purposes. 2 This surface should be primed before the application of camouflage paint. In general suitably tinted white lead/red lead primers will be suitable. 3 The choice of the type of camouflage paint to be used will be determined by its compatibility with the old paint. These were prepared with a medium containing both oil and water. Obviously these components do not usually mix, but if an oil is violently agitated with water containing a substance in solution such as glue, an “emulsion” of oil in water is produced, similar to milk, which consists of minute globules of oil permanently suspended in a watery liquid. An emulsion of linseed oil, or other drying oil, was ground with pigments and extenders to produce paints of this type, which were usually supplied in paste form. They were thinned with water before application, although when applied to exterior surfaces they tended to be thinned with a ‘petrifying liquid’, which was the emulsion medium less the pigments and extenders. After application the water evaporated, leaving a coating that became washable (to a degree). Further information on 1930s Water Paints can be found HERE and HERE. It is interesting to note the existence of a publication by the Walpamur company that was issued in 1940 and dealing with camouflage paints sold by that company and pointing out the importance of high infrared reflectance. This type of paint was prepared from bituminous materials emulsified with an agent such as soap so that they could be thinned with water, and pigmented with lime-resisting pigments and dyes. These paints were mainly used on exterior work owing to their weather-proofing properties, and were especially useful on concrete and other alkaline surfaces. Owing to the dark colour of bitumen they could not be made in white or in bright shades. They were subject to the inherent drawbacks of all bituminous materials, however, in that they had a marked tendency to bleed into subsequent coatings. These were made by adding the solid ingredients to a preparation of wool grease, made into an emulsion with water. They were chiefly used on exterior surfaces as the coating formed a water-repellent film. It was possible to produce these emulsions in brighter colours than the bituminous variety. These were made with a medium that consisted of a special prepartion of sodium silicate (or other alkaline silicates) which became insoluble on drying. Owing to the strongly alkaline nature of this medium the range of pigments which could be incorporated in it was severely restricted. For the same reason silicate paints were liable to attack fabrics brought into contact with them whilst wet; also oil paint could not be applied over them. This type of paint was only suitable for use on brick, concrete, plaster, asbestos cement and similar surfaces. As the name suggests, Flat Oil paints were ready-mixed oil paints that dried with a flat finish. Normally this sort of paint was restricted to interior use, but it could be used on external surfaces although it would not have proved very durable. See Flat Finishes for further information. 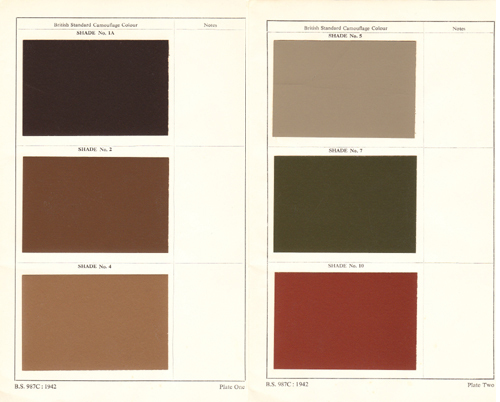 As with almost all the colours shown on this site they could be mixed into conventional modern paint by Papers and Paints Ltd.
1) Notes on Measures to be Taken in the Concealment of Buildings against raiding Aircraft, without incurring Material Expenditure. Issued by the Camouflage Committee, April 1919. 2) The Second World War Works. AP 3236. Air Ministry, 1956. 5) Pocock, R.W.. Ochres, Umbers and Other Natural Earth Pigments of England and Wales. Department of Scientific and Industrial Research. Geological Survey of Great Britain. Wartime Pamphlet No 21. January 1942. 6) Baty, Patrick and Martin Bowdler. “Defence Clothing and Textiles Agency (DCTA), Caversfield, Bicester, Oxfordshire. (Domestic Site of former RAF Bicester). A Report Following an Investigation of the Paint Colours on the External Joinery and Metalwork.” 12 March 2000. 7) Clark, Walter. Photography by Infrared – Its Principles and Applications. John Wiley. 1946. P.362. 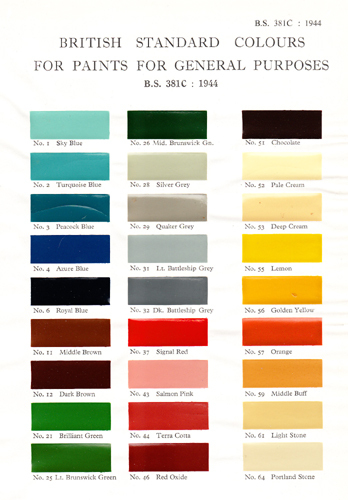 a) BS381C: 1944	Colours for Ready Mixed Paints. b) BS987: 1942 Camouflage Paints. c) BS987C: 1942 Camouflage Colours. Incl. Amendments 1 & 2.
d) BS1056: 1942	Painting of Buildings in Wartime. e) BS1124: 1942	Household Paints for External Use. f) BS381C: 1943	Colours for Ready Mixed Paints. g) BS1128: 1943 Recommendations for Primers for Camouflage Paints. 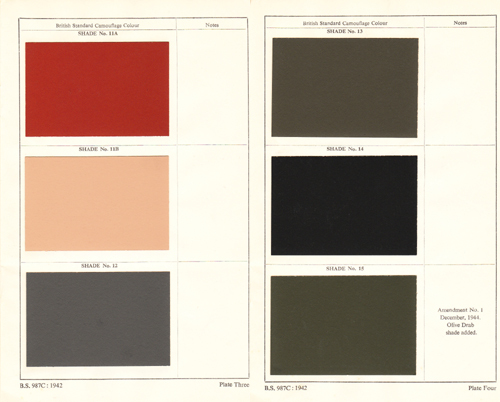 h) BS381C: 1944	Colours for Ready Mixed Paints. Colours and associated data from BS987C: 1942 and BS381C: 1944 are reproduced by permission of BSI. It is worth recording that one of the most significant figures in the development of colour standards after the War, David Medd, was called up to the Camouflage Development and Training Centre at Farnham in 1941. Medd, with his colleague, Oliver Cox, was responsible for the development of the Archrome (Munsell) Range. Fascinating. I first encountered large scale airfield wide camouflage whilst researching RAF Wroughton just outside Swindon. There, war time aerial photographs clearly showed that the semblance of hedges, duplicating the original field outlines on the 1920/30s O/S, had been daubed on the runways and hardstandings. Green areas between these hardstandings had also been treated. Thanks Alan. Unfortunately very little of this has been recorded and both time and redevelopment have caused most signs of it to vanish. Discovered you via thetearooms Twitter post, and genuinely found this to be a fascinating article, particularly because it has forced me to think about a subject that hadn’t really crossed my mind before. I am currently reading the book Wartime Britain by Juliet Gardiner, and thanks to your blog I shall be ‘seeing’ it in colour from now on! Thank you for such an excellent blog, which I shall be revisiting in the future. Thank you Sally. I always find those few colour films/newsreels of wartime Britain fascinating and will be looking at ‘domestic’ colour in the future. A very interesting article. I have recently been working with one of my students researching the use of disruptive pattern in World War I. The painted ships must have been an exraordinary sight! I am currently building a landscape diorama of an RAF station (Grimsby) and I know from aerial photos that the station was camouflaged. Built during 1940-41 I am sure that only two colours were used, this guide has certainly helped to confirm things. Thank you. Yes, I hope that this reduces your options and makes life easier. Any idea about the RAL number of CCS15 (Olive Drab)? You can ask Papers and Paints to mix the paint colours for you. They are at 4 Park Walk, London SW10 0AD. You might try contacting the RAF Museum. I did a lot of research there and they have a certain amount of useful information on camouflage. Hello Patrick, thank you for this very interesting post. Do you know if the colours themselves have changed over time? For example, is BS381C middle Brunswick green the same colour as modern BS middle Brunswick green? I have the colorimetric (xyzY) data from BS381C (a facsimile of the data itself) and have converted the ‘colours’ of a few paints from CIE 1931 Illuminant B to sRGB using tools provided and checked by Bruce Lindbloom. They do not make a close match for the RGB data of their modern equivalents. I am doing this work as a part of a small research team studying WW2 RN paint colours (‘shades’ in Admiralty terminology). Any advice would be most gratefully received. Thanks for yours. One might have thought that colour standards were set in stone. They are pretty good, but there is ‘slippage’ caused by variance in printed sources, age and surface. As soon as you start to introduce RGBs and colour monitors you open up another can of worms. As soon as one realises that, the process becomes slightly easier. All one can do is to aim high (but don’t be surprised if you miss). Good luck. Thank you for the reply, Patrick. Is it fair to say that the colours were intended to remain the same, so modern middle Brunswick green, for example, should at least approximate the colour of WW2 era middle Brunswick green. In middle Brunswick green, I have picked at random one of the paints whose name has remained unchanged. Another part of the question would be i’s the same true of paints that changed their name, though not their numeric designator (other than the added prefixing numeral, of course)’. Examples are the battleship greys which came to be called Admiralty greys. I hope that I am not bombarding you! Yes. The colours were intended to remain broadly the same. However, the ‘Brunswick Greens’ as a family of colours were achieved by combining Prussian Blue with Chrome Yellow. In reality, some versions would have been yellower and some bluer. They also, as the different versions attest, came in Light, Medium and Dark shades. The ‘Battleship’ and ‘Admiralty’ Greys are slightly confusing. The 1931, 1943 and 1944 versions of the British Standard show Lt Battleship Grey as No. 31 and Dark Battleship Grey as No. 32. In 1948 these were renumbered 631 and 632. By the 1964 issue of the Standard 631 had become Light Grey and 632 was still Dark Admiralty Grey, However 697 was introduced as Light Admiralty Grey. Is it likely that the original ‘battleship greys’ were in fact the shades used on RN warships at the time? (e.g. Admiralty Home Fleet Grey as the dark grey, and Mediterranean grey as the light grey). I suspect so. Does the TSD pamphlet ‘The Camouflage of Ships at Sea’, of 1943, help? The TSD document is that you refer to is, I believe, CB3098/43. It contained data on nine paints, two of which (G10 and B45, later called G45) we believe to be Home Fleet Grey and Mediterranean Grey, or 507A and 507C, to use their pre-1943 pattern numbers. It gives CIE 1931 Illuminant B data for them in the same manner as the then-current version of 381C. The TSD document gives the data for G10/Home fleet grey as x=32.0%, y=33.4%, z=34.6% at 10.0% ‘brightness’. BSC381C gives Dark Battleship Grey as x=32.3%, y=33.1%, z=34.6% at 12.1% ‘shade’. The xyz data are not vastly different, but TSD gave a tolerance level of 10% for the brightness of each paint, so at 12.1% in ‘brightness’, BS381C No. 32 would be twice the tolerance level. Light Battleship Grey is out in colour balance to B45 in similar proportions to the above, but it is quite a bit darker in tone (31.4% ‘shade’ for BS381C No 31, and 40.0% ‘brightness’ for B45). A gross error in testing would be needed to create this disparity, I believe, so one can perhaps assume that it is not as a result of that. This makes us suspect that the BS Admiralty greys might have matched earlier-than-WW2 versions of the two Fleet Greys. This, of course, raises more questions: If the intent was to match the Admiralty paints, did the BS colours change to reflect changes in the Admiralty paints (e.g. when blue-black paste replaced black paste) and, if so, how soon after the Admiralty change would the BS have been changed? A long and somewhat rambling post, sorry Patrick! I will leave it there for now! Thanks for a most interesting site. Having grown up following my father from one RAF base to another I have always been interested in WW2 airfields and what remains of their wartime history. I remember many buildings in 1970′s still showing green and black disruptive camo that seemed to be a distemper that over the years either washed off due to the weather or was conciously removed. Today there are many who think RAF buildings were painted green and brown but I have not found any evidence of this in my travels. My fathers experience in WW2 from 1942 when he joined up, was that many huts were just green and many brick built buildings were left unpainted, though this might be on RAF Stations prior to D-Day that still had builders on site at the same time as the airfield became operational! Incidentally I am also interested in establishing the colour schemes for RAF vehicles in WW2, as it seems every film maker thinks they were RAF Blue through to 1945! Getting info on this subject and colour photos has prooved very difficult. Any clues as where to start? Thank you for your very interesting enquiry. When I was working on the exteriors of the buildings at RAF Bicester I spent a lot of time at the Imperial War Museum looking through their amazing collection of photographs. Yes, they are virtually all black and white, but one can pick up whether camouflage was used. There is also a colour film of the period, which was very useful. I forget the name. Of course, on that site I took samples of paint to see what had been used there. Very often a ‘Water Paint’ had been applied and this had a limited life span on external surfaces. There are also pamphlets in the IWM that provide a bit of help e.g. K 1294a Instructions regarding the Painting and Decorating of W.D. Buildings. Also Schedule of Prices for Works and Repairs to Buildings, &c. of the War Department. HMSO. 1939. (Reprinted 1942).